Watchik: How about a Devon Star Wars watch? Like the iconic film series, the bold new Star Wars | Devon co-branded watch – with patented system of interwoven Time Belts™ and hybrid electro-mechanical power -- embodies the pioneering spirit of the original film and is designed to capture the adventure, hope and enthusiasm of the legendary series. Devon, celebrating its fifth anniversary this year, brings its revolutionary design, engineering and execution to the collaboration. While Star Wars features some of the most groundbreaking special effects and technology concepts, the same is true of Devon, a rare breed in the watch industry whose high-tech watches house materials sourced from a California aerospace company that works with Devon to make the impossible possible. The watches – with belt-driven time indication – are so advanced in design that they look like they are from another galaxy. The advanced engineering in the Star Wars | Devon watch movement deftly combines glass-reinforced nylon belts (used in gauges on the original 747 aircraft) with multiple high-tech optical recognition cells, micro-step motors, and 313 electrical contacts. In fact, the circuit boards and control boards alone make the timepiece a kinetic engineering masterpiece – and the perfect platform for US Aerospace meets Star Wars imagination. With this record development time, the watch design fully embraces the elements that are the essence of Star Wars tech with the elements that are Devon. To harness the Force, Devon incorporates the key elements of Darth Vader and the TIE Fighter, the starship of the Imperial fleet. Naturally, the case of the watch is created in all black DLC (Diamond-Like Carbon Coating) on stainless steel. The wings of the TIE Fighter spacecraft are part of the architecture of the case – spanning out on either side to enhance the bold rectangular case. The main screws that connect the case and lugs are reinterpreted as aircraft turbine intakes, finished with pointed silver screws that emulate the ones on Darth Vader’s helmet. Additionally, the crown is finished with the Galactic Empire logo. The otherworldly details don’t stop with the case design. Key elements are also executed within the movement. For instance, the existing belt system of the watch utilizes four motor covers that, in this case, are created in red and green to reflect the details on Darth Vader’s center console. A center hexagonal disk that features techy TIE Fighter inscriptions not only adds an industrial element, but also clearly outlines the time indications. The finishing touch is the specially made leather strap that is ribbed to replicate Darth Vader’s gloves. The attention to detail invested in the Star Wars | Devon watch is the perfect marriage of key elements from both Star Wars and Devon. 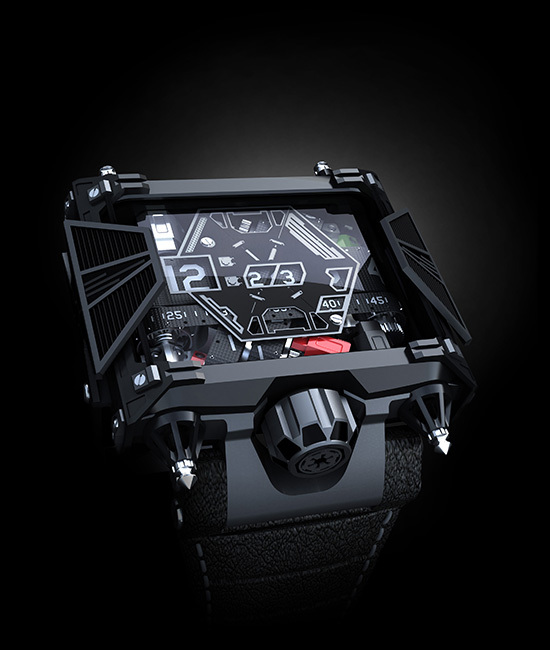 Just 500 Star Wars by Devon watches will be built over a two-year time period. Each is packaged in a specially built box inspired by Darth Vader’s TIE Fighter, and will sell through authorized Devon retailers in America and on Amazon beginning in October for $28,500 USD. The collaboration wasn't accomplished with traditional watchmakers, but rather with the US Aerospace Industry. Devon found a boutique electronic aerospace engineering company to achieve watches that are rare, different and incredibly difficult to manufacture. They have more than 300 separate parts just for the movement.